I’m kind of laughing a bit as I write a recipe for this or for any Mashed Potatoes. I mean, I just grew up knowing how to make them and in my younger years, never really thought about all the details, proportions or any hints to make them better. Times have changed, though, and these potatoes upped my Mashed Potato game and will do the same for you. When company comes or a Holiday rolls around (are you getting psyched for Thanksgiving?) that’s the time to pull out all the stops. That’s when you want the uber creamy, silky mashed potatoes with just the right amount of heft that is going to drive people nuts and have them coming back for seconds! Now that I think about it, you might want to double the recipe! I think my recipe for Best Company Mashed Potatoes came about from a Cook’s Illustrated recipe. It kinda rocked my world. I went from making mashed potatoes and adding more butter or more dairy, a bit at a time until I got the potatoes right to a no fuss, no fiddle perfect every time mashed potato. And who needs to be worried about getting your mashed potatoes just right when your company is on hand and there’s more to be done than just the potatoes? 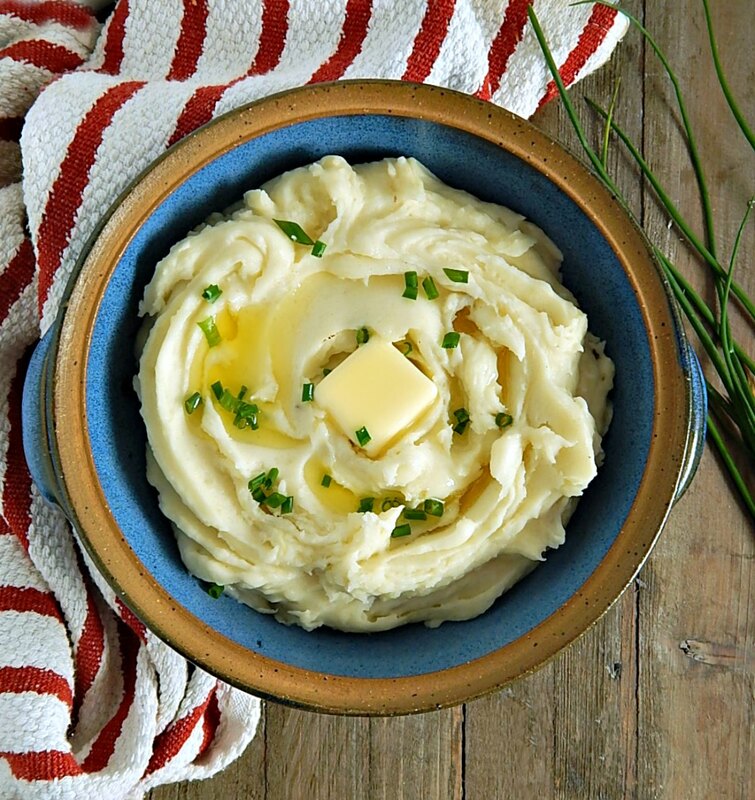 Not only are these Best Company Mashed Potatoes perfect every time, but they’re also just so darned delicious! They’re like scrape the pot delish. And yes, I use the cream option in the recipe when I make these for any special occasion. And I keep saying “I” but over the years, my son, Kraig, has taken over the Mashed Potato duty while I concentrate on getting the rest of the dinner ready! He’s a master at it, but if you’re going to “outsource” explain how the potatoes should be handled before all the last minute dinner preparations get underway. Most people will overwork the potatoes, trying to do the best job possible, but mashed potatoes need a light hand. You want to choose your potatoes wisely for the Best Company Mashed Potatoes. I prefer Russets over any potato but sometimes I’ll make these with Yukon Golds. And treat those potatoes well, too, throughout the process. Peel the potatoes, then drop in water to prevent discoloration, and if you want, do that the night before and refrigerate. Don’t cut them yet, though. You’ll do that right before you put them in the pot to cook. When ready to cut, larger chunks are better than smaller, even though they take a minute or two longer to cook, but not too large because then the outside edges of the potato pieces get done before the center is soft. About a good 2 to 2 1/2 inches is just right. Start the potatoes out in cold, salted water and the cooking will be more even, and never overcook your potatoes or they’ll be watery and gummy and you’ll notice the difference in your final mash. You should be able to pierce the potatoes with a knife and have just the slightest bit of resistance. When the potatoes are done, drain promptly and well, then return the potatoes to the hot pan and put that pan right back on the (now off) burner. Shake them around a bit and let them dry off. If you have to, turn the heat back on low for just for a minute or two but be careful, don’t scorch them. Been there, done that! As far as mashing, my regular old potatoes are usually mashed by hand, but a ricer is the best tool for Best Company Mashed Potatoes. I loaned mine to my daughter (ahem, Jess) for baby food. I didn’t think I would be blessed with five grandbabies and two stepchildren! I’m stealing back that ricer next time I visit, before she has another baby, lol! I have great results now with a hand mixer (my Stepmom uses her kitchen aid but I think that’s risky unless you have the knack for it) and I beat the dry potatoes into bits. Don’t over mix, but break them down. The room temperature butter goes in next, and here is when you need to use a light hand. That butter will coat the potatoes and keep them from being too starchy when the dairy goes in. And the dairy is best warmed for a minute in the microwave. You can use milk, half and half or cream. It’s all good. Usually by this time, I Just gently stir the dairy in. If you go wild in this step, your potatoes are going to be starchy and probably need more dairy, then you get in a cycle of stirring, adding, stirring, adding. Then when done, lid the potatoes right in the pan and they’ll keep warm for a while as you finish the rest of the dinner. Watch where you set them if you’re leaving them on the stove. Most stoves have one burner on the back left that’s a warming burner and puts off a good bit of heat. You want your potatoes to stay warm but don’t want them to dry out, so don’t use that burner. If I can’t keep them on the stovetop (or if my oven isn’t warm, below so the stovetop is warm, or you don’t have an oven below your stove) set the lidded pan aside and wrap in a towel. They’ll keep warm this way for about 20 to 30 minutes or so as you finish everything up. I like to serve the Best Company Mashed Potatoes in a warmed dish and when I’m feeling all fancy, I swirl through the top with a spoon, then drizzle in a little butter so it fills in those nooks and crannies. Then a pat of butter goes right on top, just in case there’s not enough butter, already, lol! You can’t go wrong with a few chives or thinly sliced green onions. That’s optional of course but looks so pretty and festive. If you have a warming plate, you might just want to place your potatoes on it and if your bowl has a lid, that’s a really nice way to keep your potatoes warm when they aren’t actively being served. Add potatoes to a large pot. Cover with water by an inch or two, add salt and bring to a boil. Boil about 15 to 20 minutes until potatoes are tender, cooked through and have just a bit of resistance when pierced with a knife. Drain potatoes well, then return to hot pan, shaking now and then until dry. If needed, turn the burner on low for a minute or two. Mash dray potatoes by hand or with a mixer or for the smoothest potatoes press through a ricer. Add butter and stir in by hand. When incorporated, add the dairy and stir. Taste for salt and add anywhere from 1/4 to 1/2 teaspoon, to taste. Garnish with additional butter or chives if desired. Recipe can be doubled but doon’t double the salt in the cooking water. I’m sharing my Best Company Mashed Potatoes at Fiesta Friday #249. The co-hosts this week are Diann @ Of Goats and Greens and Jenny @ Apply To Face Blog. This entry was posted in Click here for Fabulous Food Posts and tagged Cook's Illustrated, Cream, hearty sides, mashed potatoes, Potatoes, Side. Bookmark the permalink. Mashed potatoes are the number one starch dish over this way and your recipe would fit right in. And your right, a ricer is the way to go. Makes for a nice mash. Wow, i wouldn’t have guessed that about mashed potatoes. I would have thought maybe rutabagas or turnips or some really hearty cold weather veggies! Oh, we like our root veggies over here, but the potato is king. I mean what would Swedish meatballs be without mash potatoes. lol! I feel the same way!! I loved Cooks Illustrated. Such a fab magazine. These potatoes have the same ingreients as what I might make if mashed potatoes are requested. Although sometimes I add garlic. Pretty photo! Thanks, Mimi. They are fab, but I haven’t gotten or read them in a long time…it seemed like for awhile they were doing the same recipes too much. And yes, I love garlic, esp. roasted garlic. I just love potatoes any way they can be made. They’re my kryptonite!